Taiping is not a touristy town. However, ETS train to Taiping is a popular choice among locals to go back to their hometown. Since Taiping do not have any airport, train and bus are the only options left to travel to Taiping. There are not many buses to Taiping and since taking ETS train to Taiping is more comfortable, many prefer ETS train to bus. In fact, Taiping has its own attractions and unique point. Due to the frequent rainfall and the location of the town at the foothill of Bukit Larut, the weather in Taiping is not too hot like other towns in Malaysia. The tranquility and the peaceful environment that Taiping has to offer are perfect for a short healing getaway on weekend. In addition, MRSM Taiping students also use ETS train to Taiping to go back to their MRSM. It is convenient because Taiping train station is located nearby MRSM Taiping. * Duration might not be accurate and is only for your reference. Changes to fares are at the discretion of the KTM/ETS operator. There are many other ETS train ticket available for booking and you can check the ETS train availability from our Train Tickets page. Different ticket types have different price and slightly different trip duration. ETS Silver is only available for KL Sentral-Ipoh-KL Sentral route and cannot reach Taiping. Since there two ETS train route that can reach Taiping, there are more options and train departure schedule available. 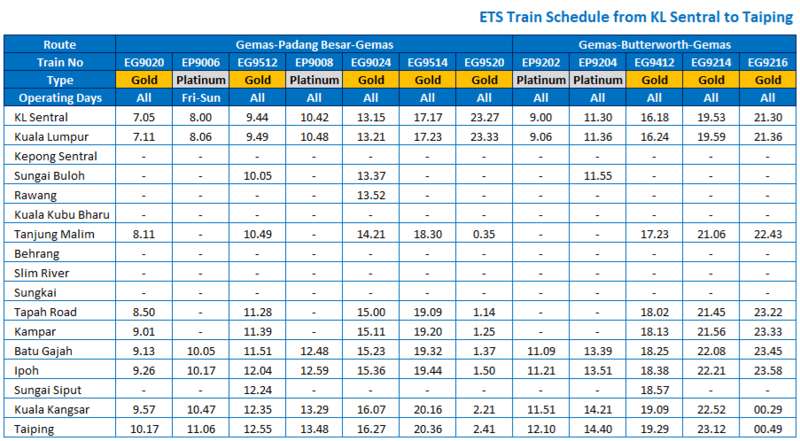 Below is the ETS timetable for train to Taiping from the south and from the north. • Click here to see ETS schedule from the South to Taiping, effective from August 2017. 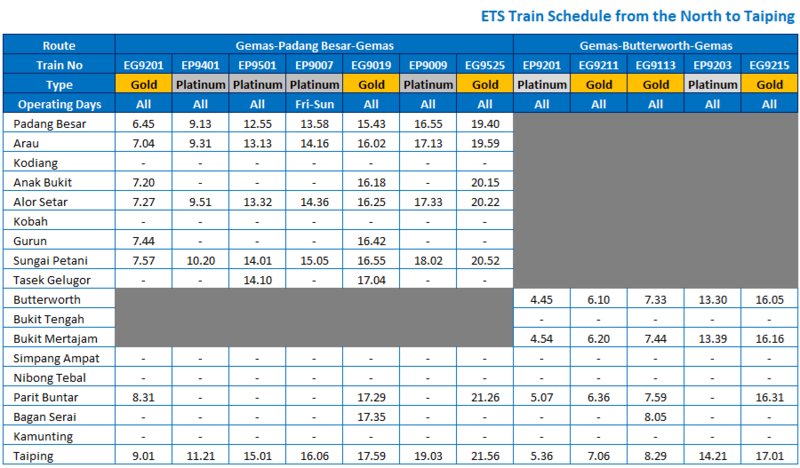 ETS train from the south actually begin from Gemas but the schedule below only includes departures that begin from KL Sentral. • Click here to see ETS schedule from the North to Taiping, effective from August 2017. Please Note: Changes to fares and time schedules are at the discretion of the operator. Actually, the first railway station in Malaysia was situated in Taiping and was opened in 1885. The train station later was dismantled and replaced with the second train station in Taiping which was relocated to Jalan Stesen. Afterward, the third train station was built next to the second train station as part of a train service-upgrading project in 2014 and currently operating to serve the train passengers. The new train station is in a good condition and equipped with better facilities for the convenience of the passengers. Unfortunately, since Taiping is not a tourist spot, the public transportation options is not much. There are taxies but it could be hard to get one. Try to ask for help from the locals or the train ticket counter if you are not from Taiping. Usually, the locals who travel to Taiping would have someone to pick them up from the train station. 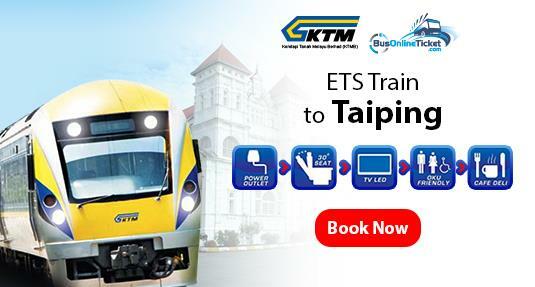 Easily Book Your ETS Online Ticket to Taiping Now!